Internationally, code officials recognize the need for a modern, up-to-date energy conservation code addressing the design of energy-efficient building envelopes and installation of energy-efficient mechanical, lighting and power systems through requirements emphasizing performance. The International Energy Conservation Code is designed to meet these needs through model code regulations that will result in the optimal utilization of fossil fuel and nondepletable resources in all communities, large and small. This comprehensive energy conservation code establishes minimum regulations for energy-efficient buildings using prescriptive and performance-related provisions. It is founded on broad-based principles that make possible the use of new materials and new energy-efficient designs. This IECC is fully compatible with the Family of International Codes. The 2018 IECC contains a reorganized Commercial Mechanical Section C403 where all provisions a type of equipment or system are in one place; for example all Economizer requirements are found in Section 403.5. The 2018 IECC requires controls on hotel guest room HVAC systems to automatically adjust when the room is unoccupied. The 2018 IECC contains improved provisions for lighting controls including occupant sensor controls; daylight response controls and time based switch controls. The 2018 IECC includes an appendix chapter which, when included in a jurisdiction’s adoption, requires commercial buildings to set aside roof space for future installations of solar collectors; and the connections and wiring to allow them to be integrated in the buildings systems. Conservation – It has a proven track record addressing the design of energy-efficient building envelopes and installation of energy-efficient systems. 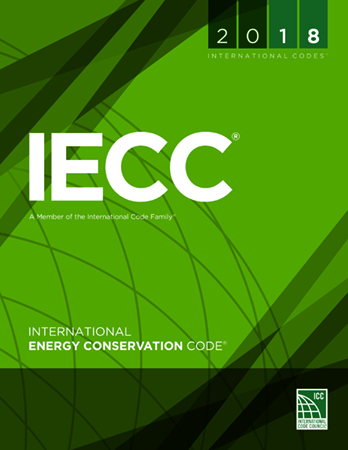 Ease of Use – The IECC uses the same easy-to-use format provided in all I-Codes. Embrace of New Technology – The IECC and its predecessors have a tradition of innovation while protecting the health and safety of the public. Correlation – The IECC is specifically correlated to work with ICC's family of codes. Open and Honest Code Development Process – The IECC is revised on a three year cycle through ICC's highly-respected consensus code development process that draws upon the expertise of hundreds of plumbing, building and safety experts from across North America. The International Energy Conservation Code provisions provide many benefits, among which is the model code development process that offers an international forum for energy professionals to discuss performance and prescriptive code requirements. This forum provides an excellent arena to debate proposed revisions. This model code also encourages international consistency in the application of provisions. The International Energy Conservation Code is in use or adopted in 47 states, the District of Columbia, the U.S. Virgin Islands, New York City and Puerto Rico. As a model code, the IECC is intended to be adopted in accordance with the laws and procedures of a governmental jurisdiction. When adopting a model code like the IECC, some jurisdictions amend the code in the process to reflect local practices and laws. ICC publishes a wide range of support products and materials to help users and enforcers of the IECC to improve their knowledge and understanding of the code. Several key publications are provided below, or get the full list from the ICC Store. Residential Energy Inspector, Commercial Energy Inspector, Commercial Energy Inspector with ASHRAE 90.1, Commercial Energy Plans Examiner, Commercial Energy Plans Examiner with ASHRAE 90.1, and Green Building—Residential Examiner. ICC provides a full suite of training courses geared specifically for the IECC. ICC instructors provide hands-on, practical problem-solving training and are available to teach on-site single or multiday courses. For more information, visit the ICC Learning Center. ICC operates a number of committees and councils related to the development and maintenance of codes and standards. There are several that relate specifically to the IECC.